Bob (the hare) invests $100,000 and takes more risk to get a higher return; he gets a 12% return for 4 years but loses 12% one year, and ends up with $138,469. Sally (the tortoise) invests $100,000 and takes less risk to get a moderate return, but has less chance of losing money; she gets an 8% return every year for 5 years, and ends up with $146,933. Bob would have felt a lot better than Sally for 4 years. It would, in fact, take a lot of willpower for Sally to stick with her investment strategy, but if she did, she would have a 22% better return then Bob! Losing money can be devastating to your investment returns. You must protect against unpredictable adversity. In the short run anything can happen. In the very long run, everything will happen. While loss avoidance is not an investment strategy, it must be a foundational investment principle. Setting an investment goal or specific rate of return is, unfortunately, not achievable. Unlike working for an hourly wage where you can work harder or longer to increase your returns, it is all but impossible to work smarter to increase your investment returns. The price you pay determines your risk : return ratio. Those that buy in when there is optimism pay a very high price, and even a small miscalculation can cause a loss. Contact Visible Investment Advisors to see if your investment portfolio is adequately protected from loss. The cheapest investment in an over-valued market may not be a bargain. The complexity of technology companies and financial institutions makes finding bargains difficult. Having to be fully invested makes it hard to wait for bargains. Having too much money makes it hard to find bargains. Most stocks are priced fairly or too high. You need patience to find stock bargains. Greed forces to you act on stocks that are not bargains. Envy of others' gains forces you to buy even though the others may have gotten the bargain. Lack of business sense to evaluate if a stock is a bargain prevents you from finding them. In trying to find a bargain, investors cannot know all there is to know. Even if they could, they could only know it about the past and present. The future is unpredictable. You need to understand not only that the stock is a bargain but why it is a bargain. There may be a good reason for the price being down. Why do stocks become over or under valued? Supply and demand, investors do not know how to value a stock, margin calls, year end tax loss selling, stock moving into index and index fund buying, window dressing, momentum investing. Forces that cause stock bargains are temporary. When selecting an advisor, broker or online trading company, conventional wisdom is to use a large, publicly held, brand name investment firm. Like most things in investing, the conventional wisdom is wrong. These firms have conflicting interests, and the individual investor suffers. The mutual fund industry operates on a double standard. Certain companies and individuals have been given the opportunity to manipulate the system. They make illegal after-hours trades and improperly exploit market swings in ways that harm ordinary long-term investors. ING had made payments of as much as $3 million per year as inducement to endorse and promote ING group annuity plans with biased investment advice. ING will also pay $30 million. Prudential Equity Group investigation revealed that the company’s brokers defrauded at least 50 mutual funds and their investors and will pay $270 million in restitution to injured investors.... [and ] a penalty of $330 million. Waddell & Reed permitted illegal trading of its funds, agreed to pay $50 million in restitution to investors and make fee reductions totaling $25 million over the next five years. H&R Block Company steered hundreds of thousands of customers into IRAs with hidden fees and low interest rates. "In addition to designing a flawed product with hidden fees and marketing it fraudulently to unsuspecting customers, senior management steam-rolled conscientious employees who objected to the fact that clients were losing money." Founders of PBHG, a leading mutual fund family, personally pay more than $120 million in restitution to investors and accept a lifetime ban from the securities industry. Robertson Stevens managers and executives knew that arrangements with market timers were contrary to claims made in the company's prospectus and harmful to long-term investors. Invesco Funds Group will pay damages of $215 million and a penalty of $110 million for entering into "special situations" resulting in billions of dollars of rapid-fire transactions which damaged typical long-term investors. Banc One investigation found that preferred investors were allowed to engage in improper, frequent short-term trading of Banc One mutual funds while diluting the funds’ returns to shareholders and has agreed to pay $10 million in restitution. MFS, the nation's 10th largest mutual fund retailer to resolve charges that the company permitted certain customers to engage in improper trading activity that cost typical investors at least $175 million. Putnam mutual funds' fee structure has benefitted management companies at the expense of investors. Warren Buffett seeks three character traits in the managers that work for him: "integrity, intelligence and energy. If a person doesn't have the first, the other 2 will kill you." Choose a manager who is independent, consistent, communicates well, measures his or her success by his clients' performance, teaches rather than tells, has low fees, and with whom you are comfortable. Managers and advisors that are independent of investment company products and pressures can better align with their clients' interests. A consistent investment philosophy is a critical success factor for providing long term performance. If the manager abandons a philosophy that is not working (selling low) to move to one that is hot (buying high), you are doomed to under-perform. Communication (listening and responding) includes understanding clients' unique objectives and tolerances, reporting (understandable) results to them on a timely basis, and meeting periodically to answer client questions and concerns - making adjustments that meet changing personal and tax situations. A manager or advisor should measure his success by his clients' performance - relative to their individual objectives and comparable benchmarks. A fee only manager or advisor that charges low fees, minimizes the costs that must be overcome for the value they add. Common sense investing is not common. Investing sense must be taught by the advisor and learned by the client. It is the only way to facilitate communication, trust, and to evaluate performance. It takes an educated person to evaluate the amount of risk they are taking, the returns they are getting compared to their risk, comparable benchmarks returns after fees and taxes, and determining if they are on track to meet their objectives. Clients must be comfortable enough to confide their hopes (objectives) and fears (risk aversion), and the advisor must candidly discuss success and failure. Is this a person you like (would you do something social with) and trust (is there transparency)? Referrals: The best method to identify potential advisors is through referrals. However, most people don't know how to evaluate their own manager because they are blinded by their relationship, or because they lack the understanding of how to do a quantifiable analysis. 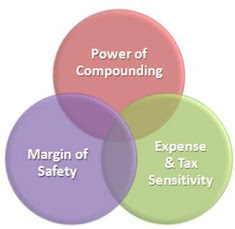 Is he or she rich: Successful investors, advisors and managers get rich from their returns over time due to the power of compounding. Rich managers get rich from client fees (perhaps a run of luck attracted a lot of new client funds). While being "poor" should be a disqualifier, having a rich advisor doesn’t mean you’ll end up that way too. Large amount of assets under management: The amount of money under management often hinders performance (the law of large numbers and the impact of cash flows) rather than helps, as evidenced by some managers and advisors closing to new clients when they get to a certain size. Works for a large brokerage, bank or investment company: Brokerages, banks and investment companies put their business first (generating profitable returns) and the profession second (meeting client needs). In recent years most of these financial institutions have come under scrutiny and been fined for acting against the interest of the individual investor – check your advisor’s history. Has other clients in your economic bracket: Managers and advisors that specialize in a certain economic bracket often develop a one size fits all solution, which will not serve all their clients well. Has a large number of clients: A large number of clients may inhibit the advisors ability to respond to (new or smaller) client needs. Use an accountant or lawyer: Accounts and lawyers will not have the knowledge, time and commitment to manage and advise clients about their investments (most successful ones use an investment manager themselves). Use your stockbroker: A commission based stockbroker, by law, only has to make sure his recommendations are suitable for his clients. A manager or advisor has the fiduciary responsibility to put this clients’ interests ahead of his own, a much higher hurdle that better aligns their interests. Use a certified financial planner: Certified financial planners have neither the time or expertise to be proficient in all aspects of your financial life (investments, insurance, estate planning, etc.). They should oversee your entire financial program, participating with you as your interact with the manager or advisor to insure your objectives are understood and help you evaluate the results to insure you are on track to achieving them. Questions that can indicate if you need an investment manager or advisor or need to make a change from your current one. How do you respond to under-performing the market for a week, a month, a quarter, a year or 3 years? How did you handle the 2000 to 2003 market downturn? Have you participated in the market sufficiently since 2003? Does market volatility keeps you up at night, make you delay financial decisions, or make you spend inordinate time 'watching' your portfolio? Do you trade in and out of securities often and at the wrong times? If you had the knowledge to properly evaluate a manager, you could be your own manager. In money managers and advisors, you don't get what you pay for. In this blog, we are trying to establish dialog on which you can learn about our integrity, intelligence and energy. Gurus are always asked for their "3 best stock ideas." What gets a top performer to the top are the results of all their stock picks. Every top performer has lots of good and bad ideas, but they don't know which will be good or bad before they make them. While top performers learn a lesson from every security selection they make, the lessons from the bad ideas don't prevent them from making bad investment decisions in the future. If you took Warren Buffett's top 10 investment ideas away, his results would be about average. When he makes an investment, he believes it is his best idea (he says "why would I put money into my second best idea if I had a better one?"). If Warren Buffett makes (a rare) bad investment, what chance does the average investor have? It is the sum total of all investment ideas that makes a top performer, and taking any subset is a random game of chance. The next time you hear a guru's "best ideas," the only thing you should be is entertained. Now we know you know! You do a real disservice to the individual investor with your selection of the best mutual fund that you highlight each day. 1. Identify them as a sector or focused fund (which is intrinsically more risky). Many times they out-perform because their sector is hot at the moment. You further mislead when you ask for their outlook - what do you think their outlook is when they are focused, have to be long and can't invest in anything else? 2. You do not compare their performance to a benchmark (large cap to S&P 500, small cap to Russell). Most are not outperforming their benchmark. 3. You do not put up a chart of last 10 years. Most people could not take the volatility and would sell at a low before the sector came into favor. 4. You do not point out their return in the last 3 months and how that affects their 1, 3, 10 year performance. If their most recent performance were taken out they would probably not have achieved the above average level of performance you are rewarding them for. 5. You do not show an after tax return. Most do a lot of trading and generate short term gains. Also, you do not ask about the level of short and long term gains of the underlying holdings and project out the tax consequences to an investor of buying the fund today. Most would under-perform with taxes factored in. 6. You do not expose the expenses and loads indicating the hurdle the fund intrinsically has to overcome to have even a market average performance. 7. You do not ask the portion of the manager's wealth invested and where the balance of their funds are invested if less than 100% (most do not take the risk of their own funds). 8. You do not identify the growth in assets and how they are generated (a billion dollar fund that grew from 100 million from investing success is a lot different than a billion dollar fund that raises a 1,100,000,000 from investors). 9. You do not identify manager or investment company conflict of interests. You need to identify the background of the manager(s) and how it can create conflicts (did they work for companies in the past that they invest in today? Probably yes.). 10. How you selected the fund for the show. They are not always the 'best' nor do they have the highest 'Morning Star' rating (which you also do not explain, nor show the performance of funds after they achieve the 'Star' rating') exposing YOUR conflicts. We are in serious times when the individual investor shoulders almost all of the responsibility for their retirement, etc., and your actions above are hurting not helping them. There is no impact on the professionals that watch your show too, they know this stuff. I know the corporate and commercial pressures you face making the above difficult to do, but at some point you have to look in the mirror and determine if you are a good guy or bad. 11. When a manager says he runs a value fund (how many people use the name Graham and Dodd and Buffett and you let this go unchallenged?) you come back and ask about GROWTH. I'll make the assumption that you don't understand the difference between how and why value portfolios appreciate, the historical out-performance of value, and the fact that the categories of value and growth is an academic factor-all stock should be bought because it has value and is expected to grow (a subject for another top 10). Editor's note: When you watch and listen to financial news or advertisements, be aware that all is not what it appears to be.